ODESSA, Ukraine -- What seems to be a war without end has filled the hearts of many in Ukraine with anger. The national currency, the hryvnia, continues to collapse and the average salary in this European country has melted down to $150 a month. Many doubt their lives will improve any time soon, and many, mad as hell, are taking to the streets. Waves of protests have erupted from Lviv in the staunchly nationalist west to, importantly, Donetsk in the insurgent east. In Kiev this week National Guardsmen lined up to protect the parliament from hundreds of protesters who were worried about the safety of their money in Ukrainian banks. They vowed to keep up the protest for days. In Donetsk, where people have been shaken by months living under siege and often under fire, people came out for the first time to rally for peace. On Monday, several hundred blocked traffic on Artema Avenue, one of the city’s main thoroughfares, while more people were gathering around the administration building run leaders of the self-proclaimed Donetsk People’s Republic (DNR). “How about our property?” protesters asked. “Stop the war!” they exclaimed. The demonstrators demanded that shootings stop in their districts, including Oktyabrskiy, Vesely and Petrovsky, where only last weekend two people were killed and about a dozen wounded in crossfire. In Putilovka district, a little girl lost her leg. After Novaya Gazeta posted a video of the rally, the DNR detained the paper’s reporter, Pavel Kanygin. But whether separatist leaders like it or not, the spontaneous protest was the first sign of a peace movement awakening in Donetsk. “All we want is peace, to be able to return to our ruined homes, not being terrified that bombing would begin again,” Svetlana, a resident of Putilovka district, told The Daily Beast in a phone interview. Svetlana had been living in a basement near the long embattled Donetsk airport together with 10 more people trying to survive on incomes of $70 a month and less. “We cannot stand this war nonsense, our patience is exhausted,” Svetlana said. By 2:00 p.m. the crowd of protesters penetrated offices of separatist leader Alekzander Zakharchenko. Zakharchenko, who was on crutches and complaining about his wounds, did not like the question. “What is your last name?” he demanded. “Don’t!,” the woman cut him off. Even fear execution did not stop Donetsk residents complaining to the armed rebels. Donetsk prices for medicine and foodstuffs are sometimes twice as high as in Kiev, the leader of the Responsible Citizens volunteer movement, Dmitry Shibalov, told The Daily Beast. “People begin to come out to demand changes. This is a positive call. 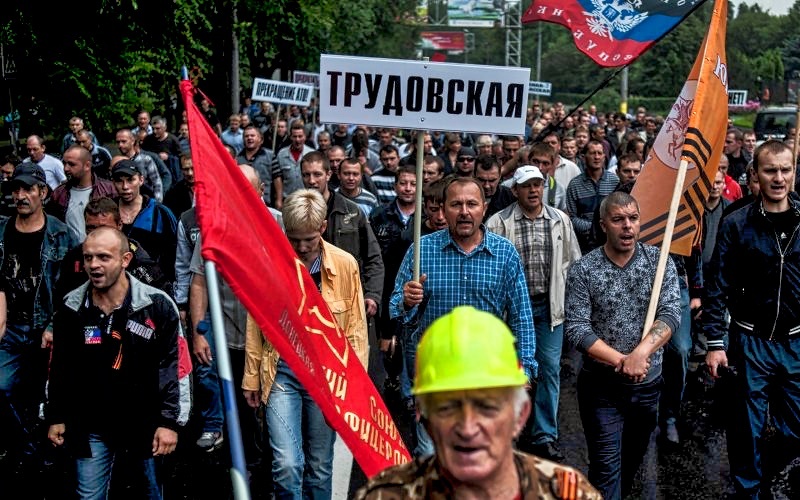 Unlike in Kiev, where the majority still want to continue the war, Donetsk locals are eager for peace, they feel pushed into a corner,” said Shibalov. The latest UN Refugee Agency report says the war has forced about 2.5 million people out of their homes. About 25,000 refugees have escaped the war to try to begin a new life in Odessa. Donetsk, they say, has become unbearable. “Even women took to carrying machine guns, many militia are on drugs, when I chose to leave, some local mafia stole my property,” says Natalya Grigoryeva, a former Honda car dealer. The government in Kiev is facing a restive population, too. The increasingly angry opposition to Ukrainian President Petro Poroshenko constructed a 2-meter-high toilet to flush him and his cabinet away on Wednesday. But for the refugees from the east, fighting corruption and economic mismanagement is less daunting than trying to live amid the devastation in the separatist regions.